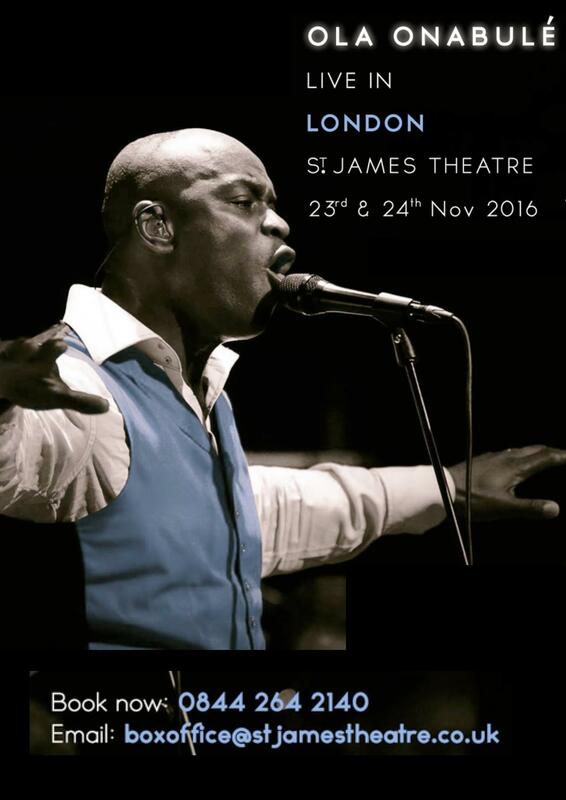 Ola Onabule is one of the finest vocalists and contemporary artists of our time. British born, Nigerian raised, Onabule writes music exempt from cliche and reminiscent of the great songwriters of the 60’s and 70’s. His music crosses boundaries uniting Jazz, Soul and World Music influences to form a unique yet highly identifiable style. As a performer, Ola has gained worldwide critical acclaim as the consummate artist. With emotional intensity and sophisticated theatricality, he utilizes the whole stage, engaging the audience, displaying vocal virtuosity interspersed with poignant storytelling. Both industry and audiences have come to realize that no specific language is needed to connect with this amazing artist, the music says it all. Ola Onabule’s new album “It’s The Peace That Deafens” is his 8th studio album and marks a departure from his previous two releases featuring a largely acoustic set uniting Jazz, Soul and World Music influences. The Album contains 12 evocative songs about identity, reconciliation and nostalgia. Words, melodies and rhythms walk a delicate tightrope of paradoxes, born of both a childhood and adulthood immersed in two disparate cultures, on two different continents and at two different times. Ola stated recently that “It’s The Peace That Deafens” is as much a work of exploration as it is a declaration. The quality of Ola’s artistry has attracted endorsements from the illustrious Neumann Microphones of Berlin and ACS in-ear monitors. Ola’s emotionally charged live performances have seen Ola perform on some of the world’s most prestigious festival stages, concert halls and jazz clubs worldwide including the main stage of the Umbria Jazz, Montreal Jazz Festival, Vancouver International Jazz Festival, Istanbul Jazz Festival, Edmonton and Victoria Jazz Festival. He has performed extensively throughout the United Kingdom, USA, Germany, Austria, Italy, Sweden, Norway, Switzerland, Finland, Russia, Mexico, Estonia, Lithuania, Latvia and Romania. The breadth of Ola’s music has led to featured appearances with Europe’s finest Big Bands and Orchestras including the Grammy Award winning WDR Big Band of Cologne as well as the Danish Radio Big Band, Babelsberg Film Orchestra, SWR Radio Big Band of Stuttgart, HR Big Band of Frankfurt and The Symphonic Orchestra of San Luis Potosi, Mexico. Ola is one of the country’s finest talents – warm and soulful in all its meanings. He is a truly great singer and song-writer. He’s an exceptionally easy to listen to TV presenter and radio presenter and because he has lived and breathed the entertainment business all his life he makes an excellent show host, – who can not only present and interview, but also perform with other artists. Ola has an absolute passion for film and cinematography. His educational background was in law with a subsequent degree in Fine Art which gives him a solid foundation for discussing and presenting the arts generally including film, television and history of art, as well as music. He is a music technology expert who produces, arranges, composes and records music for himself and other artists’. Ola talks about his career as a globe-spanning performer and music executive, while interspersing his talk with brief vocal selections. Ola’s talk includes a Q&A session covering his career, as a creative musician, pianist/composer, and critical musicologist. The event is designed to appeal to a wide array of students, including those interested in music history, African and cross cultural studies, creative industries, management (e.g., arts leadership, arts journalism, and audio arts), and music performance. British-born, Nigerian-raised, Ola’s distinct and highly identifiable style unites jazz, soul and world music influences. Onabulé is a superb singer-songwriter with wonderful timing and an impressive vocal range which has attracted Neumann of Berlin as his main sponsor. An engaging artist with the capacity to cross cultural boundaries and an unflinching pursuit of the truth in his work. His special vocal qualities have led to performances at some of the most respected festival stages, concert halls and jazz clubs worldwide. Ola is currently promoting his eighth studio album, It’s the Peace That Deafens. The album is something of a departure for Onabulé, with its largely acoustic treatment of songs about identity, reconciliation, and nostalgia. A fixture on the international festival circuit, Onabulé regularly appears with some of Europe’s leading orchestras and Big Bands, including the Grammy Award-winning WDR Big Band Cologne, Danish Radio Big band, Big Band Jazz De Mexico. Ola also runs his own label, Rugged Ram Records from the beginning of his career. His latest album is distributed by Dot Time Records in the United States and Europe.